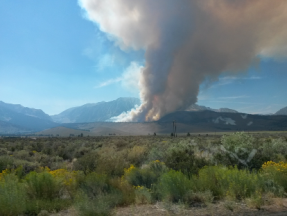 Monitoring the effects of fire on air quality can include visual monitoring and associated notes, photographs, aircraft observations, satellite imagery, air quality monitoring data, and post-burn evaluations. Also consider monitors which may already be in place to record air quality for state monitoring programs, or webcams that may already be in place on national forests and other areas to document air quality. Federal agencies also have particulate monitors available upon request through the National Interagency Fire Center for temporary use during wildfires. Monitoring helps protect the public by providing an assessment of air quality impacts caused by fire activity. This information can be used to inform future decisions, and help to identify potential contributions to an exceedance of air quality standards. Plan and be aware.